It’s true: The Criminals are being buried for the 2nd time. 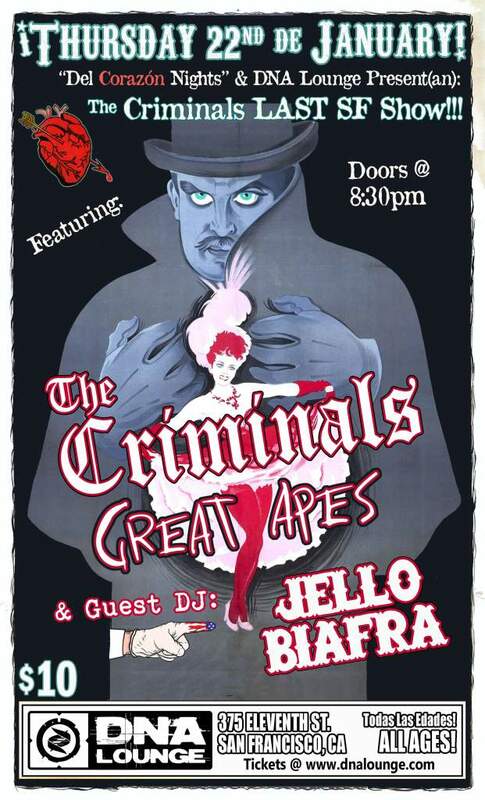 It’s our last show EVER, with GREAT APES opening & JELLO BIAFRA spinning records! We were first around 1994-2000, and then were resurrected to play 1-2-3-4-Go!’s annual festival in 2012. Since then we’ve had a blast reconnecting with old fans and making new ones up and down the West Coast and- memorably- out at the 2012 Fest in Gainesville. For this final show we’re joined by our friends Great Apes from San Francisco and honored to have Jello Biafra spin records before, between, & after the bands. There are only TWO bands, so blink and you’ll miss it! Notes: Our final show with GREAT APES opening and JELLO BIAFRA spinning vinyl! © 2012 The Criminals . Email Us .